Call 502-966-4104 (Toll Free: 866-966-4104) for pricing and order placement. Jefferson Animal Hospital is open 24/7, 365 days a year. Located at 4504 Outer Loop, Louisville, KY 40219. Local pickup (Louisville and surrounding areas) available any time. 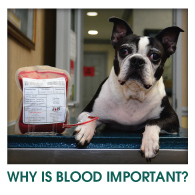 All of our canine donors are blood typed for DEA 1, 4, 5 and 7. In addition they are screened annually for Anaplasma spp., Babesia spp., Bartonella spp., Brucella canis, Canine Hemotropic Mycoplasma, Ehrlichia spp. and Leishmania spp. RealPRC tests, Lab 4Dx test for Heartworm, Ehrlichia and Leptospirosis and Lyme, along with comprehensive health screening. 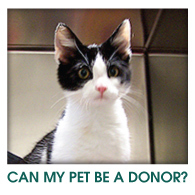 Our feline donors are screened annually for Anaplasma spp., Bartonella spp., Cytauxzoon felis, Ehrlichia spp., feline coronavirus (FCoV), Feline Hemptropic Mycoplasma, FeLV and FIV RealPCR tests, FeLV antigen and FIV antibody by ELISA, along with comprehensive health screening.